My goal is for all students and private guiding clients to play and learn continuously. I mention natural history and ecology on nearly every private trip I guide but I also design and lead programs for individuals and school groups that help teachers in public schools meet the Common Core requirments for New York State in innovate ways. My outdoor teaching style is informal but nonetheless designed to challenge students and accomplish goals. Courses for Schools: My school-based programs integrate outdoor experiences into traditional courses in visual arts, language arts, math, social studies and music. I am passionate about teaching patterns in nature and am developing a K-12 curriculum to help teachers spark lifelong learning about nature. I am happy to explore grant funding for schools that are not able to pay for these programs under current budget limitations. Additionally I teach with two other outstanding educators, Sheri Amsel and David Thomas-Train. Together we bring Champlain Valley public school classes to DaCy Meadow Farm and Black Kettle Nature Trail through a collaboration called the Champlain Valley Outdoor Education Cooperative. Young Naturalists From 2010 until 2013 I met with a group of home schoolers every Thursday to learn about science in the field. Each season we followed a specific theme. In 2010 we hiked, biked and paddled in the Westport and Wadhams, NY area to learn the basic plants and animals that share our home habitat. 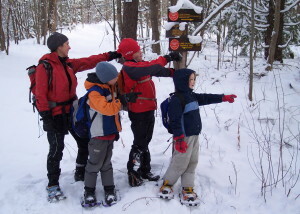 Between January and March, 2011 we focused on the northeast corner of the Adirondack Park, visiting Clintonville Pine Barrens, Wickham Marsh and Ausable Chasm. In 2012 and 2013 we hiked, paddled and biked eight sections of the Boquet River from Keene to the outlet in Willsboro. The group no longer meets because the students all have begun attending school. I would welcome the opportunity to work with a new group. Professional Development: With Sheri Amsel, I designed a professional development weekend called Wild Science . This program is a relaxed-but-packed curriculum and builds a supportive network of educator-naturalists. Please contact us to set up a Wild Science program. Please contact me if you need a naturalist and guide to help you teach outdoors.